The Lindner Center for Conservation and Research of Endangered Wildlife’s (CREW) world-renowned scientists form critical partnerships with other leading conservationists and governmental and non-governmental organizations to achieve CREW’s mission to Save Species with Science®. Learn more about CREW’s facility and exciting conservation projects through powerpoint presentations and/or tours. 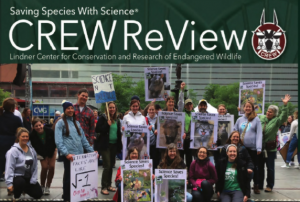 The CREW ReView is CREW’s annual publication that provides conservation and research progress updates. 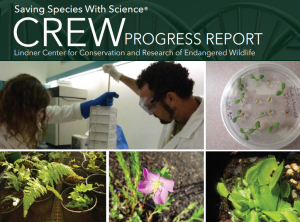 The CREW Progress Report is published between CREW ReView releases and also provides conservation and research progress updates. These programs introduce students to the conservation science that goes on at the Zoo everyday. CREW Programs are the perfect way to supplement your Zoo visit! When are CREW Programs available? Each program is approximately 90 minutes and includes a presentation and tour. Make your reservations at least two weeks in advance. Programs are held regardless of weather conditions unless a weather emergency is declared. How much are CREW Programs? Where do CREW Programs take place? This 45-minute presentation explains how CREW scientists are using science and technology to conserve endangered animals and plants worldwide. Highlighting the four Signature projects: rhinos, small cats, polar bears, and exceptional plants, this program focuses on propagation, assisted reproduction, and cryopreservation research in both the plant and animal divisions. Exceptional Plants Grade 7 and up Exceptional plant species are those plants that produce few or no seeds, or plants with short-lived or recalcitrant seeds (seeds that do not survive drying or freezing). This 40-minute presentation highlights research projects taking place in the Plant Division. 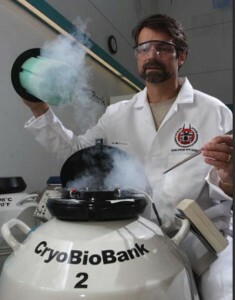 This program focuses on technologies used for collection, propagation, and preservation of Exceptional Plants, which include tissue culture, cloning, DNA analysis, and cryopreservation. Building Tour of CREW Grade 6 This is an excellent opportunity to incorporate science into the school day, while visiting the Zoo. During this 30-minute guided tour of the CREW building, students will have the opportunity to see scientists in the labs and, in the process, gain a better understanding of the science taking place right here at the Cincinnati Zoo & Botanical Garden! that provides a unique opportunity to new, enthusiastic scientists seeking careers in conservation-related fields. Since its inception in 1997, CREW has had more than 18 Postdocs complete their training and move on to rewarding careers. What is the Post-Doc Program? The program typically lasts two years and emphasizes many aspects central to CREW’s mission including education, research, and international training. Program objectives are multi-faceted. It provides an opportunity for academically oriented scientists to gain experience in coordinating conservation-based research projects in a zoo setting. This requires learning how to design scientific studies that can be conducted on intractable animals about which little is known. Postdoctoral Fellows must work closely with zoo keeper staff, collaborate with other zoological institutions, conduct research at distant zoos or in the field using a ‘mobile lab’ approach, and relate the importance of their work to the general public as well as the scientific community. The program has broadened the scope of research at CREW by bringing in scientists with varied expertise, interests, and fresh, creative ideas. Furthermore, it has increased the scientific productivity of CREW. CREW’s Post-doctoral Training program has attracted excellent candidates both nationally and internationally. Trainees have gone on to secure permanent positions in various capacities that allow them to continue pursuing their interests in both wildlife and plant conservation research. The Public Exhibit is currently under construction, please stop back. Contact [email protected] or call (513) 961-2739 for more information. All CREW Special Event proceeds benefit the Zoo’s Lindner Center for Conservation & Research of Endangered Wildlife (CREW) – the umbrella for all local and international conservation and research efforts of the Cincinnati Zoo. Be sure to attend Zootini, Wild About Wine and/or Zoo Brew to show your support! Check the Events section of this site for dates, times and ticket information.